The microprocessor-based transmitter can be equipped with various electrochemical DragerSensors. This way, you can easily detect oxygen and various toxic gases in the ambient air. In addition, the Polytron 8000 can also be integrated into your digital fieldbus system, thus providing additional diagnostic functions. With its HART ability, the Drager Polytron 8000 allows remote access using the Drager PolySoft software for the quick and convenient evaluation of the instrument status. Integration in existing management systems (e.g. PactWare) is also possible using DTM. In addition, fieldbus systems such as Foundation Fieldbus or Profibus are supported by corresponding interfaces. The housing has four mounting holes. Two different mounting sets are available for installing the Polytron 8000: a duct-mount and a pipe-mount set. This means that the transmitter can be easily installed anywhere - e.g., on a smooth wall, a pipe or an exhaust duct. On request, the Drager Polytron 8000 can be equipped with three integrated relays. This enables you to use it as an independent gas detection system with two arbitrarily adjustable concentration alarms and one fault alarm. Audio alarms, signal lights, or similar devices can, thus, be controlled locally - without an additional cable between the transmitter and a central controller. The sensor signal can be evaluated using the 4 to 20 mA signal. 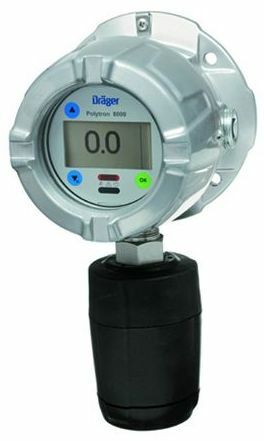 The Drager Polytron 8000 can detect over 100 different gases. DragerSensors are specifically designed for the demands of 24 hours a day, 365 days per year operation. The large DragerSensor size gives them their renowned long life and superior measurement performance. The integrated sensor memory contains all relevant sensor data. This also allows the Polytron 8000 to accept pre-calibrated sensors, the Drager Polytron 8000 is a virtually maintenancefree transmitter.